I'm all for adding new pieces to my closet on a regular basis, the only problem is my tiny little apartment (and closet) really don't store a whole lot. I guess it's the downfall of these little NYC apartments, but I'm not complaining. Mainly because I found a new secret weapon to this problem, and it's Le Tote. Which is a monthly subscription service starting at $19 ($49 for the boutique box where they send you 5 pieces, 3 pieces of clothing & 2 accessories) at a time, for you to wear for as long as you'd like. Send them back and get a whole new shipment, it's unlimited through the month! With all that being said, I've teamed up with Le Tote to offer my awesome readers their very own chance to fall in love with the service by offering you 50% off with promo code "thefrugalistadiaries"! So go check it out, and let me know what you think. And until then, check out what I wore and how I wore it from the box! This post has been brought to you by Le Tote, as always all opinions are my own. Thank you for supporting the brands that make this blog happen. oo I really like the shirt dress. I hear you on small closets. I have one myself. This idea, as an alternative to ownership, makes a lot of sense for consumer goods like clothing. It would work for me. Thanks! Too difficult to pick a favorite. 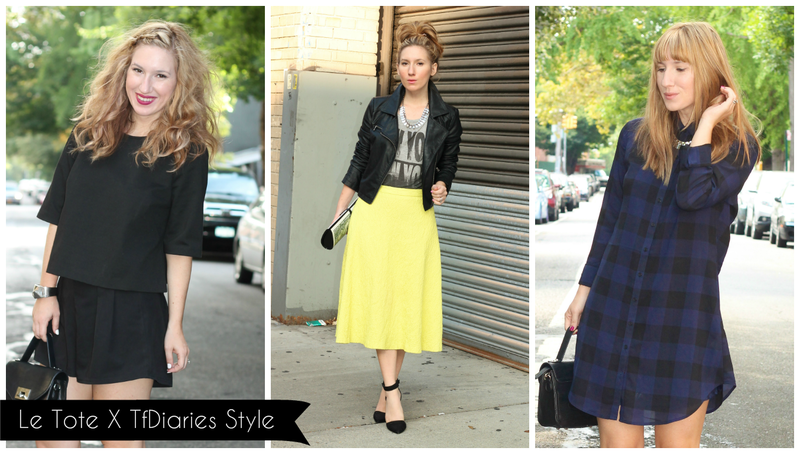 I definitely need the boxy top, the full skirt and the dress. Flannel dress for fall? Perfect. OHHH love love love the shirt dress it is amazing!